An innovative Independence Day wish! The Indian-grown FMCG Company scored high on ad awareness and created a strong association with its brand on Independence Day. Patanjali used Truecaller's Branded Call solution to achieve a record breaking 200 Million Impressions on a single day. On the occasion of Independence Day, Patanjali wanted to reach out to a large audience and invoke the spirit of patriotism and economic freedom by encouraging them to adapt to made-in-India products. The company was looking to spread the message of Swadeshi using an innovative solution. They relied on Truecaller to deliver their objective of gaining pledges from their loyal customers. Founded in 2006, Patanjali Ayurved Limited is an Indian FMCG company. It has achieved a tremendous footprint around the globe and throughout India in a small time period. The company launched an #ISupportSwadeshi campaign and wanted to reach out to their customer base in Hindi Speaking Markets to encourage them to take the pledge to use Swadeshi products. 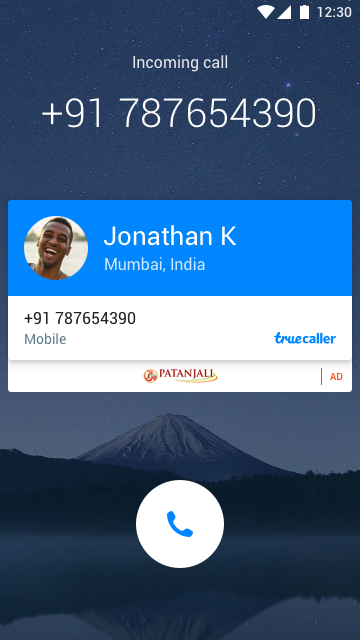 Truecaller along with Mangodata crafted an innovative solution for Patanjali where, Yoga Guru & Founder of Patanjali - Baba Ramdev called Truecaller users wishing them on Independence Day and urging them to take a pledge to support Swadeshi products. The campaign was set up with audio recordings of Baba Ramdev delivering an Independence Day message on 15th August. Customers received a call from Baba Ramdev with the help of Truecaller's Call Profile Solution. 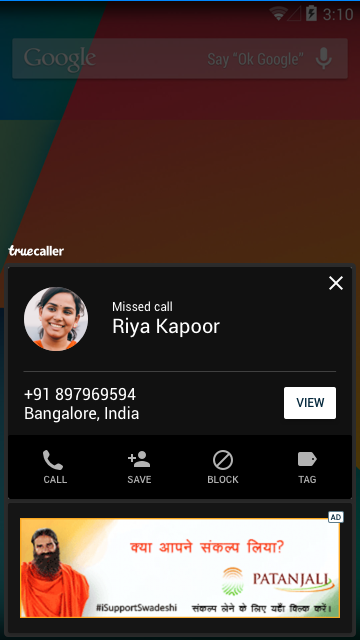 Truecaller users picked up the call, some out of curiosity and some with an exhilarated feeling of surprise. The campaign garnered a phenomenal answer rate of 40%, which is 1.3x the industry average. But it didn’t end there. The message was amplified using Truecaller Impact properties. Patanjali took a full App-Takeover that resulted in immense visibility and top of mind recall for the brand on this important day. This advertising product is best suited for creatively delivering a brand's message and create massive impact at scale by owning 100% SOV across inventory on Truecaller for 24 hours. The ad unit delivered massive reach and Patanjali received a whooping 4,30,894 clicks on a single day with a record breaking 200+ Million Impressions . Patanjali effectively designed the communication to focus on the Independence Day message with a Hashtag - #ISupportSwadeshi and a clear Call to Action button encouraging the audience to take a pledge.